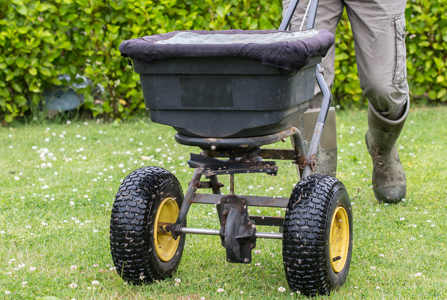 There are thousands of fertilisers available for your garden lawn. These range from the basic weed, feed and moss killer combinations sold in garden centres to the sophisticated feeds used by professional groundskeepers to look after the turf at sports venues like Wimbledon and Lord’s. Here at Lawn & Weed Expert, we use lawn fertiliser products that are exclusively available to industry professionals. We provide a comprehensive range of services to help you keep your lawn lush and green, and where necessary, we discuss our requirements with manufacturers to get the best results for our customers. The nutritional essentials of turf care are much the same whatever feed is used. Nitrogen, phosphorous and potassium – combined with a range of trace elements such as magnesium and sulphur – are all required to give your lawn the balanced nutrition it requires. Moisture, acidity and alkalinity are key considerations too. Lawn & Weed Expert’s lawn fertiliser service ensures that your lawn gets the right balance nutrients for the right time of year. Nitrogen in various forms is essential to promote leaf and stem growth and keep your grass green. However, too much nitrogen will give you too much top growth, and your lawn will eventually develop a spongy thatch that may necessitate heavy scarifying. Potassium is crucial for improving the overall health of the grass. Trace elements such as iron, magnesium, manganese and sulphur can also play a major part in boosting the health and appearance of your garden lawn. When it comes to lawn fertilisation, you get what you pay for. Cheap feeds are markedly less effective than professional-grade fertilisers. Some feeds can scorch the lawn if weather conditions are wrong; other feeds simply wash (leach) right through the soil after a heavy rain shower. Lawn & Weed Expert use controlled-release feeds that act gradually, steadily feeding your lawn with the correct variety of nutrients. This contributes to the health and appearance of your grass while also helping it to withstand the extremes of cold, heat and drought that it may experience over the course of the year. Lawn & Weed Expert provide lawn fertiliser services across South Wales. Get in touch now to request a FREE lawn assessment with no obligation.